For many people, learning to trade cryptocurrency can be scary. It’s much easier to sit on your investments and HODL. While there’s nothing wrong with that approach, it’s important to realize that you’re leaving money on the table. Even for assets that you plan to hold for a long time, it’s possible to make a lot of money on the ups and downs while you’re waiting. This can easily double or triple the number of coins and tokens in your portfolio without you needing to add any extra income from your regular earnings. That alone makes it worth it to learn to trade cryptocurrencies, and with a little knowledge, it’s not difficult to do it successfully if you’re keen to learn and willing to be patient. Unfortunately, there are of course some big problems for newcomers to this scene. Many cryptocurrency investors are young, and they have no investing experience at all, let alone crypto investing experience, which is a whole different ball game. Many of them also have limited funds to spend on learning, and there are often limited tools available that will allow you to practice your trades without wasting a lot of your capital. How can you learn cryptocurrency trading with no risk? The best way to learn cryptocurrency trading with no risk to your existing portfolio is to use a cool free tool called Bitsgap. 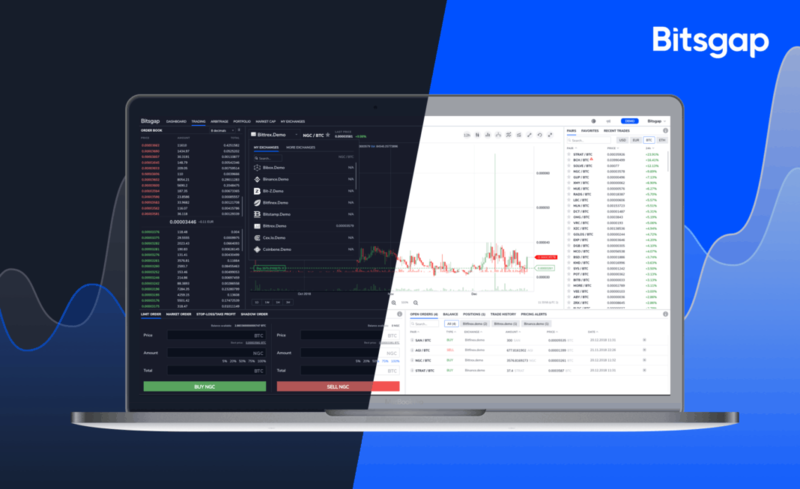 This tool features a great cryptocurrency demo trading function which allows you to get started with learning how to trade without risking your capital. When using the demo feature, you can trade live using actual market conditions. They also have lots of great technical analysis tools available that allow you to draw trend lines and view things like the moving average to make better trades. If you’re new to cryptocurrency trading, then you might not know what all of these things are yet. That’s okay because Bitsgap is simple enough that beginners can use it to trade, but when you’re ready to get more advanced, the features are there. The Bitsgap team also has a blog full of helpful articles that can help you to learn what everything means and how to use a lot of these indicators for your trading activities. When you’re ready to start trading for real, you can easily switch to Live trading. You can connect the APIs for all of your exchange accounts and take advantage of Bitsgap’s best feature, the fact that you can trade on 25+ exchanges from one interface. This makes it super easy to manage your portfolio at a glance and execute trades without having to juggle multiple logins. Using an aggregated platform like this saves you a ton of time and makes it super easy to see how much profit you’re actually making. Plus, if you want some additional profit you can check out the arbitrage page that will allow you to execute arbitrage trades with just a couple clicks between exchanges. This is free profit for you, and the app does a great job of helping you manage these trades. Where do you start with cryptocurrency trading? Cryptocurrencies have trading pairs. This means that when you’re trading a currency, you’re trading it against the value of another currency. For example, when trading ETH/BTC, you’re trading Ethereum against the value of Bitcoin. Some pairs are easier to trade than others, and some pairs might even cost you a premium based on supply and demand! Be careful here and make sure you’re using the right pairs for maximum profit potential. Sometimes you can arbitrage these pairs to make more profit for yourself when making trades! If you use the Bitsgap platform, their order function is very easy to use. All you need to do is select the type of order you want at the bottom of the screen. Enter the amount that you want to pay, the number of coins and hit the buy or sell button. There are multiple types of orders you can place to help your trading. Here’s what they mean! If you want to buy an asset but only for a certain price, you would use a limit order. Your order will only be filled for the price you specify. These orders will not be filled unless your price is reached. A market order executes a price for whatever the current market price is. Use this if you need to buy or sell assets quickly. You might not always get the best deal with this order type. Use these advanced order types to make sure your orders execute when certain price thresholds are reached to make sure you either earn a profit or don’t lose money when a trade goes south. Shadow orders allow you to place orders which are not on the books, like stealth mode. It also doesn’t freeze your capital so you can have multiple open orders depending on certain conditions. It’s a unique and very useful feature for Bitsgap traders. While this article is by no means an exhaustive guide to cryptocurrency trading, it is a good start. There’s a lot to learn here, but if you’re dedicated to becoming a great trader, then you can do it. There are endless resources available online on Youtube and other websites. There are also lots of great tools and apps which can help you succeed and you should learn how to use them. It’s important to give yourself every advantage to make money as a cryptocurrency trader. Don’t forget to use the advantage of cryptocurrency trading tools provided by Bitsgap, as these will help you to get a better experience while learning basics. Next articleLitecoin Price Prediction: LTC Found Support at the Recent High, Is It Heading for the $48 Top Again?